These shallow channels looked like they might have been cut by a woodworker’s router. But they were cut — or I should say chewed — by Longhorned Borer beetle larvae, feeding on the cambium of a eucalyptus tree. 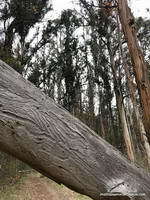 Fallen eucalyptus in Rivas Canyon. 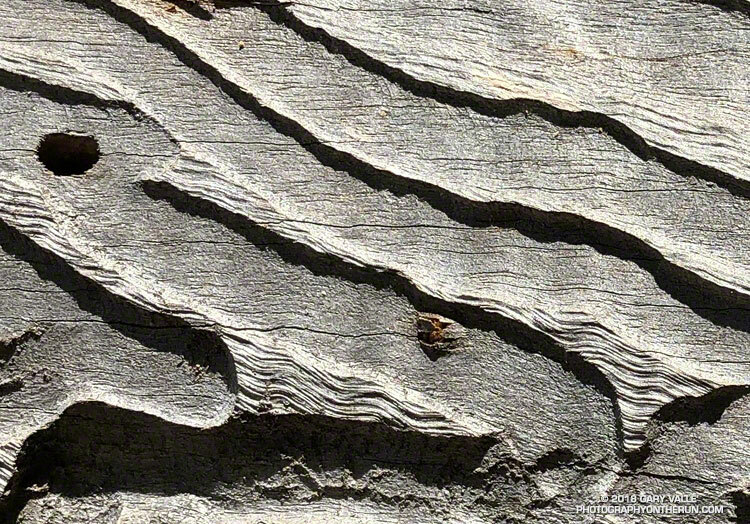 The grooves are from beetle larvae feeding on the cambium of the tree. The tree was across the trail in Rivas Canyon. Not unlike the fallen oak on Rocky Peak, Southern California’s multi-year drought likely weakened the eucalyptus, making it susceptible to other pests. The Rivas Canyon Trail connects Will Rogers State Park to Temescal Canyon. Today (and last weekend) I ran it as part of a long loop from the “End of Reseda” at Marvin Braude Mulholland Gateway Park. From last Saturday’s Shortcut – Chantry – Mt. Wilson Loop run. Was running down the Chamberlain segment of the Backbone Trail Saturday, when a flash of bright red on a manzanita bush caught my eye. Very bizarre, as nature often is. 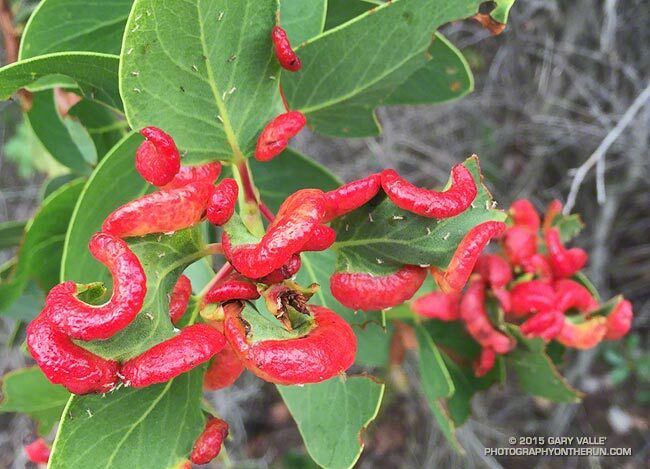 At first glance I thought the bulbous red objects on the manzanita were some kind of larvae, but on closer inspection could see it was a swelling of the leaf. My first thought was some kind of viral infection. What they turned out to be are aphid induced leaf galls. Galls generally provide a protective habitat and enhanced food source for the inducing species and their tenants. I was on the way back from Mugu Peak and about four hours into my run. I’d stopped at an exposure of Miocene age shale along the Upper Sycamore Trail. The gray-brown rubble is home to an intensely blue-purple wildflower called spreading larkspur (Delphinium patens ssp. hepaticoideum). I’d just snapped a series of bracketed exposures of one patch of the flowers when suddenly there was the bumblebee-on-steroids buzzing of a hummingbird in front of me. At least I thought it was a hummingbird. It sounded like a hummingbird and was about the right size. Its blurred wings were shaped like a hummingbird’s. It flew with the precision of a hummingbird, darting from flower to flower, deftly feeding on each blossom’s nectar using its oddly shaped beak. 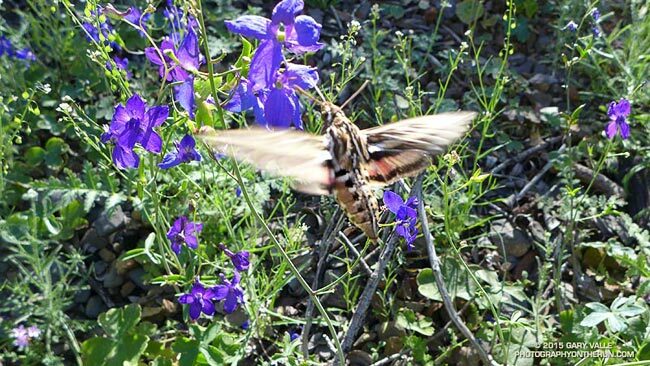 But it wasn’t a hummingbird — it was a hummingbird moth — a white-lined sphinx (Hyles lineata). I’d read about hummingbird moths, but to have one suddenly appear and start feeding on a larkspur plant I happened to be photographing was extraordinary. 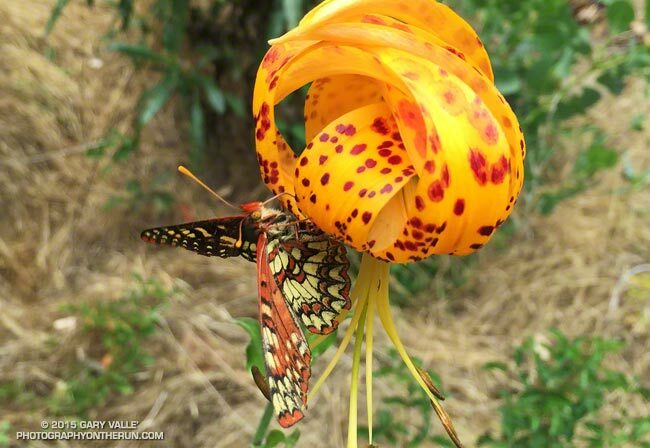 Apparently the problem of feeding on the high-energy nectar in certain types of flowers is sufficiently definitive as to have produced a very similar evolutionary solution in wildly different organisms. The sphinx moth is described as flying like a hummingbird, but which lineage produced this elegant solution first? It may have been the moth! A trace fossil of a sphinx moth found in Early Eocene Asencio Formation of Uruguay appears to predate the earliest known Oligocene fossils of hummingbird-like birds! In any case it appears that both hovering moths and birds co-evolved with the flowering plants on which they feed and pollinate. September & October are Tarantula Months! 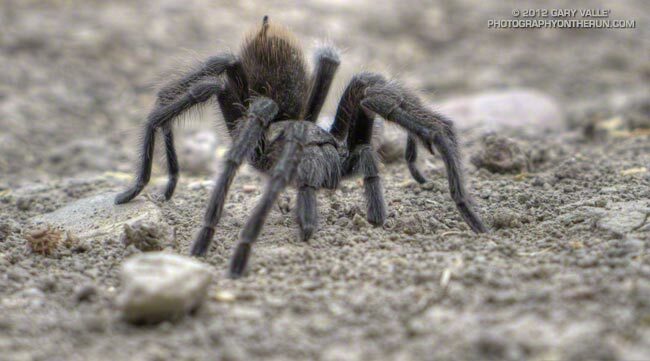 Since 2005 these are the dates I’ve photographed a tarantula at Ahmanson Ranch (Upper Las Virgenes Canyon Open Space Preserve). Autumn is when maturing male tarantulas (Aphonopelma spp.) wander about in search of a mate. I was beginning to wonder if I would see a tarantula at Ahmanson this Fall. The last time I hadn’t seen a tarantula in September or October was 2008. 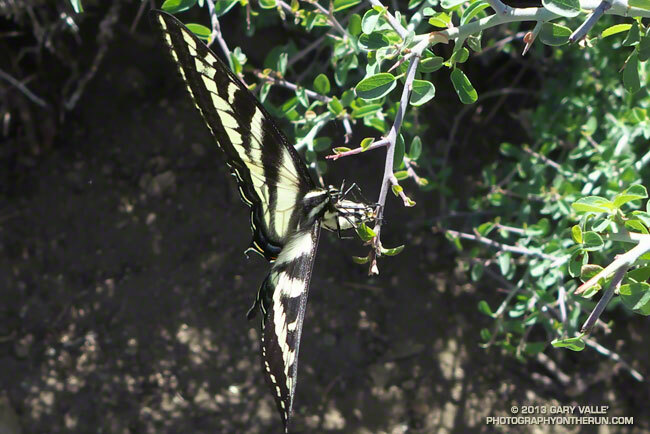 Yesterday I spotted this one on the main fire road in East Las Virgenes Canyon on a run over to Cheeseboro Canyon. The title photograph is from a run on September 5, 2012. The raised abdomen is a defensive posture. Tarantulas will scrape their abdomen with their bristly rear legs, launching irritating (urticating) barbed hairs into the air. 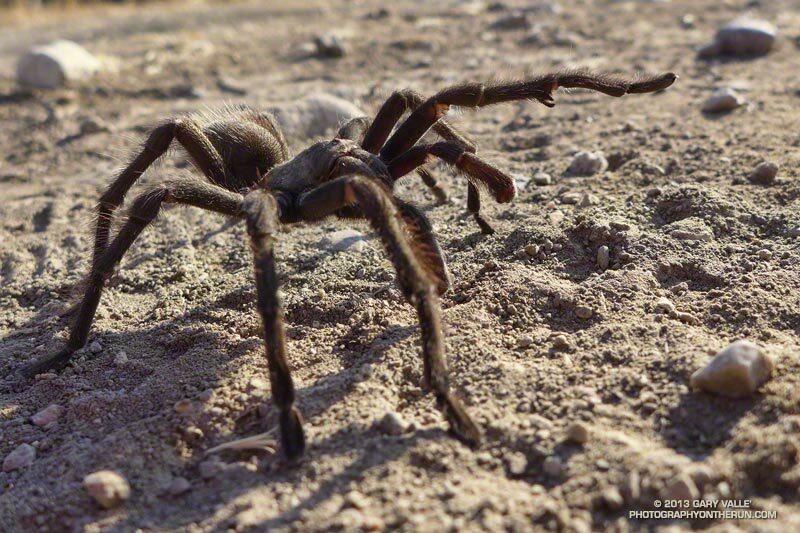 Most tarantulas I’ve encountered this time of year do not react defensively — they’re just interested in finding a mate. We had run from Mt. Pinos (8831′) to Mt. Abel (~8280′) on the Vincent Tumamait Trail stopping by Sawmill Mountain (8816′) and Sheep Camp (8200′) along the way. Valley temps were forecast be well into the 100s, but here had ranged from a cool 60-something in the shade to the high 70s on the exposed sections of trail — perfect for trail running. I’d paused at about 8700′ on the way back up Mt. Pinos to take a photo of some phlox, when a western tiger swallowtail flitted past and started to land here and there on a spiney low shrub at the margin of the trail. There was something peculiar about the butterfly’s behavior. Rather than stopping completely, it would hover briefly at one spot and then move to another. There were no flowers on the snow bush where it was hovering, so it wasn’t feeding. Perhaps 18-24 inches away, the butterfly reacted when I started to move the camera, so I just stood quietly, holding the camera near my waist and took several photos. A closer look at the photos revealed the butterfly was laying golden-green eggs on the snow bush.